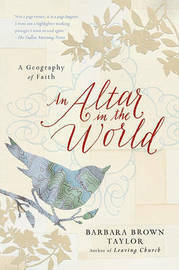 In the New York Times bestseller An Altar in the World, acclaimed author Barbara Brown Taylor continues her spiritual journey by building upon where she left off in Leaving Church. With the honesty of Elizabeth Gilbert (Eat, Pray, Love) and the spiritual depth of Anne Lamott (Grace, Eventually), Taylor shares how she learned to find God beyond the church walls by embracing the sacred as a natural part of everyday life. In An Altar in the World, Taylor shows us how to discover altars everywhere we go and in nearly everything we do as we learn to live with purpose, pay attention, slow down, and revere the world we live in.